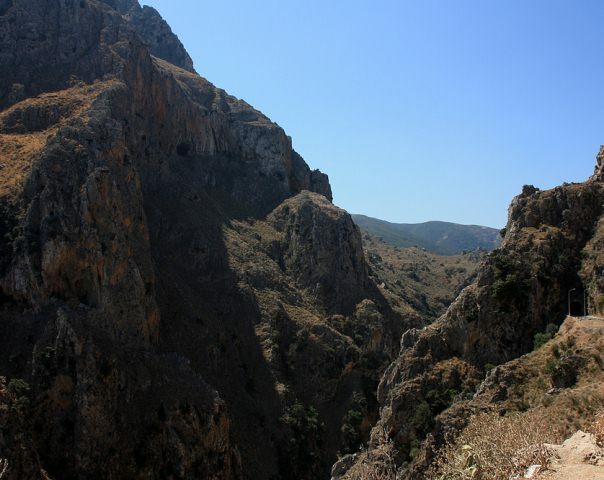 The wild gorge of Topolia lies in west Crete, on the road to Elafonissi beach. It starts south of the village of Topolia and ends after 1,500m at the village of Katsomatado. At its narrowest point it reaches 300m in height, while its width varies from 5 to 50m. The gorge is crossed by river Tyflos (“Bind” in Greek). It hosts rare fauna and flora, (plane-trees, wild olive trees, oaks, arbutus, ferrets, hares, greenfinches and various other species). It is also worth visiting the Cave of Agia Sofia, with a rare species of cave spider (Pholcus creticus), located just above the main road. Legend has it that the gorge hosted fairies and Vritomartis, a goddess worshiped on the island in the Minoan times. It was here where the legendary giant Talos, the warder of Crete, used to rest and enjoy the divine music of the fairies and elves of the Topolia gorge. The area is protected under the Natura 2000 Programme.